The majority of the technology conference talk might be currently centered around Apple’s WWDC 2013, and the goodies that it might bring, but we shouldn’t be forgetting about the annual Google I/O event that begins on May 15th. 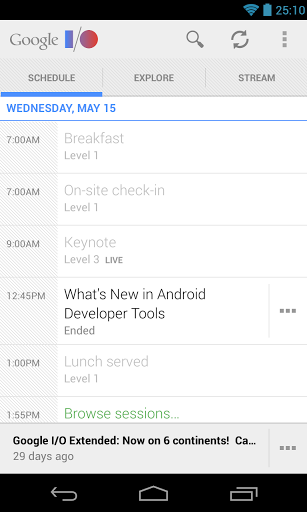 To celebrate the fact that the doors of the Moscone will be imminently opening, Google has pushed out some fairly significant updates to the official I/O conference app for Android devices. The app itself acts as a fairly vital companion tool for any excited technology fan who will be joining the Mountain View elite at the Moscone Centre next week. The latest update to the app features a rather gorgeous looking design that is immediately recognizable as a Google mobile creation, but it’s the additional add-ons to the app that will make the difference for those who intend on using it. The usual functionality of being able to synchronize the chosen sessions and participate in Google+ sessions is still available. 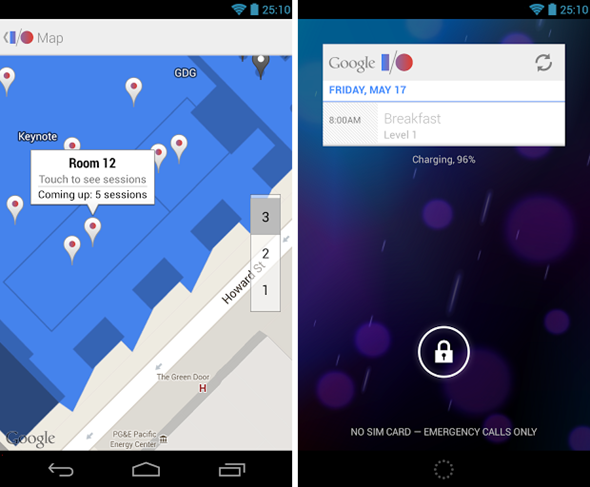 In addition to the existing functionality that was found in last year’s app, it is now possible for those attending to scan attendee badges via Near Field Communications (NFC) as well as being able to get an immediate glance at your own personal agenda through the included lock screen widget. Any changes or amendments to the conference are now also immediately synchronized between all of the user’s devices making it a lot easier to manage time effectively during the time of the event. Users of the app can now also use their Google+ credentials to directly log in to the app, and will be able to benefit from automatic Wi-Fi setup that comes with minimal fuss. Perhaps one of the best looking parts of the new functionality is the vector-based mapping enhancements that not only ensure delegates get to where they need to be but also contains information on each of the sessions that they will be attending. The updates to the Google I/O app are live on the Play Store right now and have been optimized for the best possible performance on smartphones and tablets running Android Gingerbread 2.3 and above.